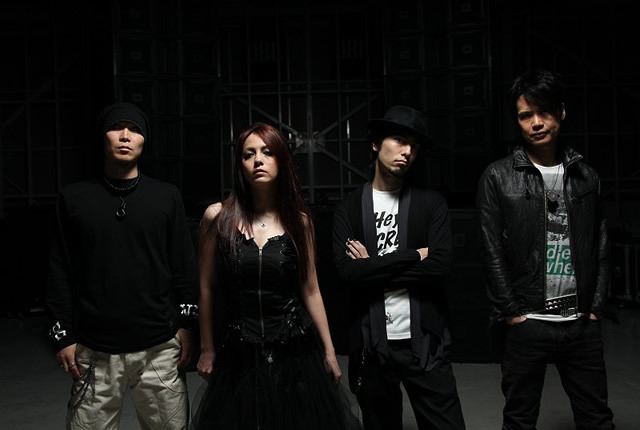 The Alternative Heavy Rock Movement is currently experiencing an explosive rise in popularity even here in Japan. Already on the scene and clearly standing out from amongst them, the name permeating through is none other than Head Phones President. The highlight of HPP is female vocalist Anza’s beautiful yet painful, and violently thrown about passionate feelings, and the raging billows of heaviness and groove that swirl through her performance. The emotional scale and dynamism of this mixture of vivid emotions with tribal rhythms and beautiful melodies never fails to overwhelm. HPP’s 1st Maxi Single “escapism” reached the number 1 position on the Singles Charts at the Tower Records Shibuya store in Tokyo within a mere 3 days following its release. That same day, an in-store performance drew a massive 300 people marking their shocking debut. From 2002 straight from their in-country tour Head Phones President launched their international tour. The first step was the New York tour in the autumn of 2002 and despite it being the first time to perform in New York, it was a massive success. HPP’s 1st Full Album “VARY” once again captured the number 1 position on the Indies Charts at the Tower Records Shibuya store in Tokyo. The Major Indies Charts aside, combined domestic and international sales of VARY placed it at 9th position on the National Full Album charts in the first week of its release, climbing to 8th position in the second week; a truly brilliant achievement. In addition, HPP release the maxisingle + DVD”de ja dub” at 2004, maxisingle “WhitErRor” & mini album “vacancy” in 2005, 1st Live DVD “Toy’s box” in 2006. 2007, HPP go to Sweden, Taipei, Los Angels. And they release 2nd full album “folie a deux” in December. 2008, they supports “In This Moment” from LA in Japan & China. And HPP go to Australia, Taipei. Oct, performing at “LOUD PARK” (w/SLIPKNOT, CARCASS, etc). And release live DVD “PARALYSED BOX”. Nov, performing at “TASTE OF CHAOS” (w/MUCC, STORY OF THE YEAR, AS I LAY DYING, etc). Recently there has been many instances of overseas fans who, waiting impatiently for HPP’s international tour, have come to Japan requesting to see Head Phones President. Nowadays besides America, Head Phones President have won over a wide range of fans from around the world. It seems likely that the fans expectations of HPP will only continue to increase.